GUATEMALA CITY – Flooding and landslides from the season’s first tropical storm have killed at least 150 people and left thousands homeless in Central America, officials said Monday. Dozens are still missing, thousands have lost homes and emergency crews are struggling to reach isolated communities cut off by washed-out roads and collapsed bridges caused by Tropical Storm Agatha. The sun emerged Monday in hardest-hit Guatemala, where officials reported 123 dead and at least 90 missing. In the department of Chimaltenango — a province west of Guatemala City — landslides buried dozens of rural Indian communities and killed at least 60 people, Gov. Erick de Leon said. In the tiny village of Parajbei, a slide smothered three homes and killed 11 people. Volunteers from nearby villages worked nonstop since Sunday to recover the bodies in Parajbei, and on Monday they found the last two: brothers, 4 and 8 years old, who were buried under tons of dirt, rocks and trees. As a thank-you, rescuers got a plate of rice and beans from the mayor of nearby Santa Apolonia. “It’s a small thing, but it comes from the heart,” Tulio Nunez told them through a translator. Nunez said he worried about the well-being of survivors in the area because the landslides blocked roads and burst water pipes. “They don’t have anything to drink,” he said. In all some 110,000 people were evacuated in Guatemala. Thousands more have fled their homes in neighboring Honduras, where the death toll rose to 15 even as meteorologists predicted three more days of rain. Two dams near the capital of Tegucigalpa overflowed into a nearby river, and officials warned people to stay away from swollen waterways. “The risk is enormous,” Mayor Ricardo Alvarez said. In El Salvador, at least 179 landslides have been reported and 11,000 people were evacuated. The death toll was nine, President Mauricio Funes said. About 95% of the country’s roads were affected by landslides, but most remain open, Transportation Minister Gerson Martinez said. The Lempa River, which flows to the Pacific, topped its banks and flooded at least 20 villages, affecting some 6,000 people, said Jorge Melendez, director of the Civil Protection Agency. 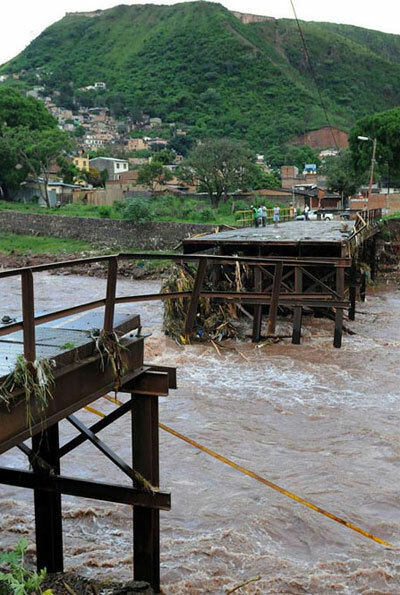 Officials warned that the Acelhuate River, which cuts through San Salvador, was running at dangerously high levels and threatened to spill over into the capital’s streets. The rising death toll is reminding nervous residents of Hurricane Mitch, which hovered over Central America for days in 1998, causing flooding and mudslides that killed nearly 11,000 people and left more than 8,000 missing and unaccounted for. Rescue efforts in Guatemala have been complicated by a volcanic eruption Thursday near the capital that blanketed parts of the area with ash and closed the country’s main airport. Officials are now allowing helicopters and propeller planes to take off, but commercial flights remain grounded. The Atlantic hurricane season could be the busiest since 2005, when Katrina and Rita caused massive destruction along the same part of the Gulf Coast now struggling with the largest offshore oil spill in U.S. history, government scientists said Thursday. Eight to 14 storms would strengthen into hurricanes, with top winds of 74 mph or higher, the agency said. Three to seven of those could become major storms that reach Category 3 or higher _ meaning they bring sustained winds of at least 111 mph. A hurricane might help break up the oil spill staining the Gulf of Mexico, but the oil won’t affect significantly how tropical storms develop, forecasters said. They don’t know what kind of environmental hazards to expect, though there are fears that winds and waves could push the oil deeper into estuaries and wetlands. The expanding slick already has coated wildlife and marshes in Louisiana, but Lubchenco said the spill is still small relative to hurricanes _ which sometimes span the entire Gulf. The 2010 government forecast is based on the weakening of El Nino. The Pacific Ocean phenomenon created strong wind shear that helped suppress storm development in the Atlantic last season. Record warm water temperatures also will feed storms crossing the Atlantic this year. Tropical storms are named when their sustained winds reach 39 mph. The first named storm of the 2010 season will be Alex. In April, Colorado State University researchers predicted 15 named storms would form this season, with four developing into major hurricanes. The Atlantic hurricane season begins Tuesday and runs through Nov. 30. Associated Press writer Suzette Laboy contributed to this report from Fort Lauderdale, Fla.